Asean Secretary-General Ong Keng Yong of $ingapore said that a regime change in Burma could lead to Iraq-style anarchy. $ingapore's Foreign Minister George Yeo very much said the same. But Kyaw Zwa Moe, the Managing Editor of The Irrawaddy Publishing Group, said: "Asean officials are talking nonsense. First of all, no one has called for a regime change. What the monk-led demonstrations demanded were national reconciliation, the release of all political prisoners and an improvement in the living standards of the people." (AFP). Air Bagan is on the US blacklist. Asean officials are talking nonsense. Several ministers and diplomats of Asean countries warned recently a sudden regime change in Burma could lead to Iraq-style anarchy with rival factions battling each other for power. Are such people that ignorant of Burma which itself belongs to the 10-member Association of Southeast Asian Nations (Asean)? ''We should not think of a so-called regime change,'' said Asean Secretary-General Ong Keng Yong of $ingapore, which could lead to another Iraq. ''Such change implies a dramatic power vacuum,'' he said. $ingapore Foreign Minister George Yeo said the same. First of all, Mr Ong and others must know that no one has called for a regime change in the military-ruled country. No one says there isn't a need for the military regime's involvement in politics and in the day-to-day running of the country. The Burmese people, including the political opposition groups, all understand the military has to play a key role in a transition to democracy. At the end of the day, however, soldiers must go back to barracks which is their home. Even if the junta did collapse, there are many capable people, including Aung San Suu Kyi and other leaders, who can assume leadership roles in the government. Even the opposition National League for Democracy, led by detained pro-democracy icon Aung San Suu Kyi, and despite being a big winner in the 1990 elections, has called for an unconditional dialogue which includes the military, opposition groups and ethnic parties. Other opposition and ethnic groups inside and outside the country have advocated the same thing. The monk-led demonstrations last month demanded three things: national reconciliation, the release of all political prisoners and an improvement in the living standards of the people. Monks didn't call for regime change, either. Following the junta's brutal crackdown against the peaceful demonstrations, some countries in the West have increased sanctions on the regime, in hope that it may force the junta to start face-to-face talks. Everyone is pushing the stubborn generals to enter a dialogue process. What about the ethnic groups? There are about two dozen ethnic insurgent groups, with probably 17 groups under declared cease-fires. Are they a unified opposition? Far from it. Are they a hotbed for anarchy? Far from it. They have as much to fear from anarchy as everyone else. In fact, anarchy is the best description of Burma's present state, a military-ruled system of anarchy... For decades, military rule has proved itself incapable of governing the country. Burma was once one of the most promising and wealthiest countries in the region before the military took power in 1962. Burma is now a prison, and its people are among the poorest in the world. Most ethnic insurgencies are products of the military rule, though a few rebel groups such as the Communist Party of Burma and the Karen National Union began their struggles soon after Burma gained independence in 1948. The 45-year military rule since 1962 fuels the ethnic insurgency movement. In fact, those ethnic armed groups - both cease-fire and non-cease-fire - have called for a form of democracy that would provide autonomy for their respective states. The hope is that, if granted autonomy, the anger supporting the decades-long insurgencies would die out. Burmese General Thein Shin [left]. refused to export sand to $ingapore. The junta either can't stop the insurgency movements or it has deliberately kept the flame of opposition alive to create the impression that the military is essential to ''protect'' the country from the threat of various ethnic groups. Asean countries may believe that only the junta can control the insurgency movements, but that is not the case. The ethnic groupings and their dissatisfaction with the current regime is essentially a political issue. Even if the junta did collapse, there are many capable people, including Aung San Suu Kyi and other leaders, who can assume leadership roles in the government. However, at the moment almost all potential leaders are in prison or in exile. And, of course, there are also ethnic leaders who are ready and capable to join the leadership as soon as the right conditions exist. Any ''power vacuum'' would be filled by new, talented people who are now denied the opportunity to serve their country. And, need it be said, with such open-minded people in government a ''power vacuum'' would be an opportunity to replenish the soul of the nation with freedom-loving people. In fact, anarchy is the best description of Burma's present state, a military-ruled system of anarchy. Here are a few examples: the regime uses hired thugs to create riots amid peaceful demonstrations. The thugs are called ''dutiful citizens''. They were organised to murder Mrs Suu Kyi in 2003, but she narrowly escaped. During the 1988 uprising, the then-government deliberately created a condition of ''anarchy'' by freeing thousands of angry criminals from the jails across the country. The stooges were paid to poison several water wells in Rangoon's townships, among other things. If Asean officials really want to help solve Burma's crisis, they must stop talking nonsense and using scary words such as ''power vacuum'' and ''anarchy''. The military junta deliberately created conditions for them to loot factories and warehouses. Then, the coup-staging generals called it ''anarchy''. Yes, it was state-sponsored anarchy. For decades, military rule has proved itself incapable of governing the country. Burma was once one of the most promising and wealthiest countries in the region before the military took power in 1962. Burma is now a prison, and its people are among the poorest in the world. It's time for Asean officials to do some serious soul-searching by asking if they want to be a friend of the Burmese people or a friend of the generals. 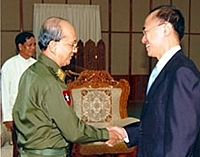 $ingapore's foreign minister, George Yeo, said: ''We must prevent anarchy in Burma.'' If Asean officials really want to help solve Burma's crisis, they must stop talking nonsense and using scary words such as ''power vacuum'' and ''anarchy''. Instead, they urgently need to help stop the state-sponsored anarchy which, for the Burmese people, is midnight on a moonless night - it can't get any darker. Note: The author is the managing editor of The Irrawaddy Publishing Group, which publishes The Irrawaddy News Magazine (www.irrawaddy.org). Click here for the latest on Burma.